A B M P m e m b e r s e a r n F R E E C E a t w w w. a b m p . c o m / c e b y r e a d i n g M a s s a g e & B o d y w o r k m a g a z i n e 21 NEWS NOTES compiled by Brandon Twyford Editor, Online and Digital Strategy | brandon@abmp.com MTs Hold High Job Satisfaction The results of the Federation of State Massage Therapy Boards (FSMTB) 2017 Job Task Analysis indicate that massage and bodywork practitioners are overwhelmingly satisfi ed with their occupation. The fi ndings were derived from thousands of survey responses from massage and bodywork practitioners across the country. Signifi cant fi ndings include: • 98 percent of practitioners said they like being a massage therapist • 97 percent of respondents said they are happy they entered the massage therapy profession • 97 percent said they are proud to be in the fi eld • 96 percent said they were enthusiastic about their occupation • 94 percent said they strongly identify with the massage therapy occupation "While we know consumers enjoy many benefi ts from receiving massage, this is an extraordinarily high amount of positivity and satisfaction exhibited by massage and bodywork professionals," says FSMTB Executive Director Debra Persinger. 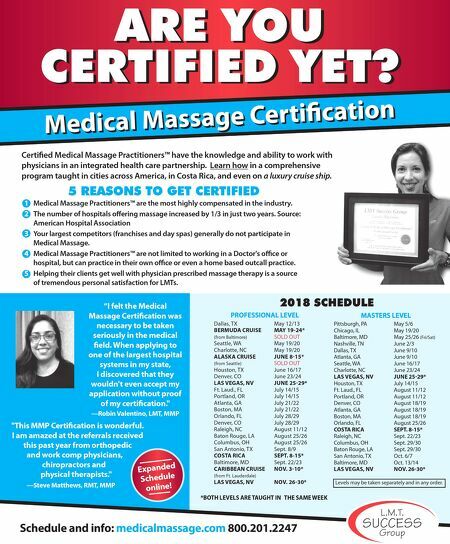 "To be part of a helping and healing profession has intrinsic rewards, and we are glad to be able to measure some of the value that massage and bodywork professionals experience." The Job Task Analysis is undertaken every fi ve to seven years by the FSMTB to ensure that the profession's sole licensure examination, the Massage & Bodywork Licensing Examination (MBLEx), refl ects current practice. The complete 2017 Job Task Analysis will be released once analysis of the data is complete. ABMP Launches Associate Membership ABMP is now offering Associate membership to individuals who don't need or want liability insurance but are interested in ABMP's Education Center, custom website and marketing materials, and other member benefi ts. ABMP Vice President of Communication and Professional Outreach Leslie Young says the new membership category is a way to say yes to a variety of individuals who are interested in a noninsurance membership option that still includes all of ABMP's top-shelf member benefi ts. "We're hearing from so many practitioners—some are international, others are allied professionals such as physical therapists and occupational therapists—who are keen to access our incredible online continuing education courses." ABMP Associate membership offers more than 175 hours of CE, a customizable member website and marketing materials, and a suite of member discounts for $199. ABMP members of all levels can receive a $20 referral credit for each member they recruit. For more information, visit www.abmp.com/associate-membership or call 800-458-2267. Eric Stephenson Named Chief Wellness Offi cer for Elements Massage Elements Massage announced the hiring of Eric Stephenson as the brand's fi rst-ever chief wellness offi cer. Stephenson will work closely with more than 240 Elements Massage studios nationwide to implement continuing education and culture programs. "Elements is the fi rst national massage franchise brand to create the role of Chief Wellness Offi cer," says Jeremy Morgan, CEO of Elements Massage. 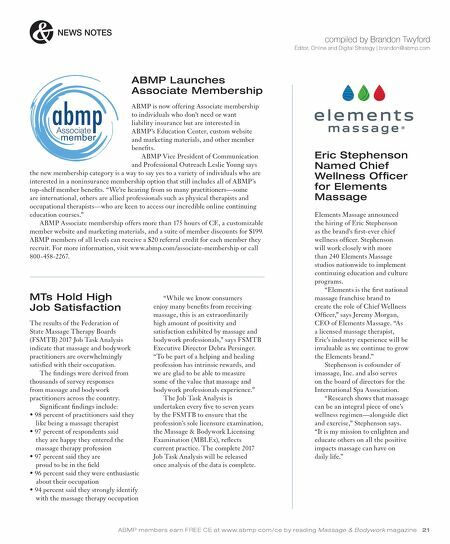 "As a licensed massage therapist, Eric's industry experience will be invaluable as we continue to grow the Elements brand." Stephenson is cofounder of imassage, Inc. and also serves on the board of directors for the International Spa Association. "Research shows that massage can be an integral piece of one's wellness regimen—alongside diet and exercise," Stephenson says. "It is my mission to enlighten and educate others on all the positive impacts massage can have on daily life."